Instead of playing outside or going to a friend’s house, children suffering from cancer are constantly in and out of hospitals. But Camp Rainbow — a local non-profit that allows children with cancer and blood-related illnesses to attend a camp for free — gives kids the chance to be a kid, even if it’s just for a little bit. Some parents immediately embrace the program, while others are hesitant to send their children away to Camp Rainbow’s annual overnight camp that lasts for a week, especially with the medical care some of these children need. But the camp has 24-hour full-time nurses and oncologists to help ease the parents’ worries, as well as give kids medicine if need be. It creates a safe environment for the children to fully enjoy camp. 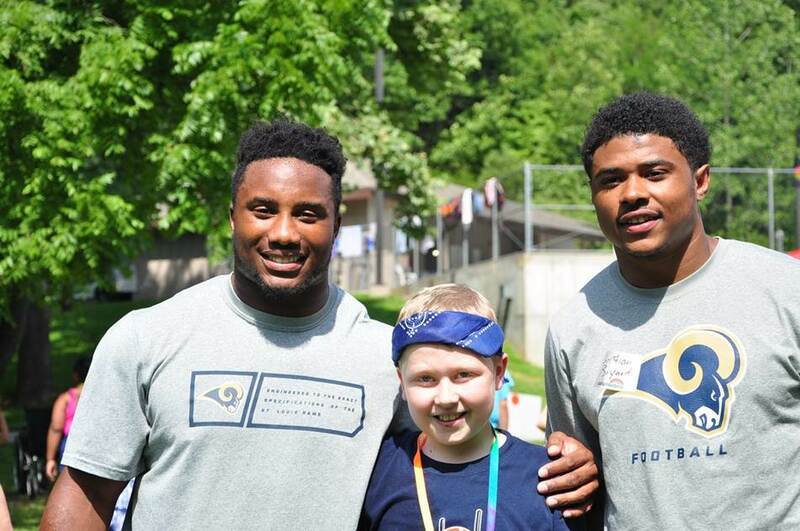 Adding to the camp excitement was Rams safety Christian Bryant and running back Benny Cunningham , who recently stopped by the camp to participate in games and meet the campers and caregivers. Bryant and Cunningham bounced from group to group, saying hello to the children and participating in different activities. The first was “the Oreo game,” where Bryant and Cunningham raced to see who could move an Oreo from their forehead to their mouth, using only their face to move the cookie. After a few minutes of missed attempts, the two called it a draw before playing a round of “Ninja” in another group. After both games, Bryant and Cunningham autographed items and took photos. Another highlight of the day was the Jell-O toss. Campers bombarded the staff with Jell-O, shaving cream, chocolate syrup and various other items that left volunteers covered from head to toe. Staff members escaped with shaving cream in hair, Jell-O stained clothes and desperately needing a shower, but couldn’t help but smile. Camp Rainbow started in 1988 as an overnight camp with 25 kids participating. Twenty-seven years later, it has expanded to a full week with more than 400 campers, in addition to four other camp programs: Camp Rainbow Teen Camp, Day Camp for 4-6 year-olds, Camp Rainbow Camp-In Program — a two-day camp-like experience for children at St. Louis Children’s, SSM Cardinal Glennon and Mercy hospitals — and a family camp held in September. “Knowing what it’s like for families to go through it, I try to put myself in it and be a part of it and just ease it as much as I can,” Cunningham said, who is no stranger to cancer. Cunningham’s family has encountered cancer and like the families at Camp Rainbow, they understand dealing with cancer is an everyday battle, regardless of age. Camp Rainbow makes that battle a little easier.